This week's Tuesdays with Dorie recipe was delicious and quick- I love that! I subbed out the tart crust for my new favorite chocolate cheerio crust. It's "healthy" (all things considered) and super quick. 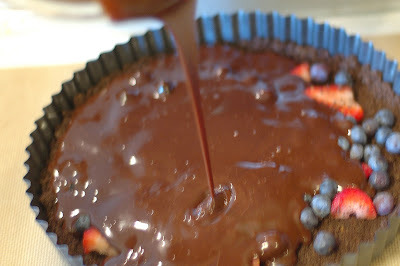 Pour a little ganache on top and you have a tasty treat that was eaten even quicker than it was made. My testers didn't notice the berries inside so nice time I think I'll just leave them out to put on top. Please don't look too closely at my piping job. I almost failed the Wilton course one cake decorating class and deservedly so (that's one of the many reasons I love cupcakes!) 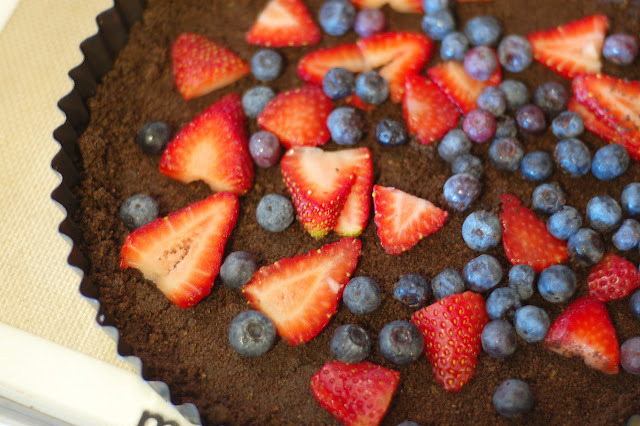 I do hope you'll try the chocolate cheerio crust- I'm loving it lately! Come back tomorrow for St. Patrick's Mint brownies. Mmmmm. Grab the real tart recipe at Rachelle's. it does look and sounds healthy :) something to go on my "to try" list. i wish our stores would hurry up and get the chocolate cheerios! This looks absolutely delectable! I must buy some of those chocolate cheerios now!!! Your tart looks gorgeous! And the chocolate cheerio crust sounds insane. I'm definitely going to try that soon! Love the idea for the chocolate cheerio crust. Your tart is lovely! I skipped the raspberries and thought the tart was tasty even without them, though it was quite rich. Your tart is gorgeous and so inventive with the Cheerios in the crust!